I've just published a collection of autobiographical stories. Call them sins of my old age, if you like (apologies to Rossini). Strange as they may at first seem, these stories are as close to the truth as words on paper can achieve. Distinguished young cello virtuoso Sarah Mae Spieler really did receive a dire warning in a Chinese restaurant under the watchful eye, singular, of a lime-green dragon. And only moments later, the oddest coincidence involving a pastry she’d never heard of changed her life. Axel Stowne, in a muddle over a Beethoven piano sonata and, well, his life, really did find a Goldfish on Palm Avenue. Gilbert Trillweiler without a doubt took the most circuitous route possible on the way to finding his way in music. The offspring of British actress Margaret Rutherford makes an entrance at a very unusual tea party in the garden of an historic home in Charleston, South Carolina. The thoughtful reader will notice here an overlapping of certain incidents, the retelling of stories in different contexts, which, if nothing else corroborates their veracity. Sarah Mae, Axel and Gilbert are pseudonyms, as are Dorothea, Cheryl, Susan and Morris. The others are real. Here you will find, gentle reader food for thought, or at the very least, entertainment. I can attest to the fact that the incidents are all true because I was there. 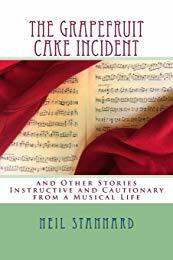 Read an excerpt here: The Grapefruit Cake incident.